I didn’t like the first generation Everest. To me, it was too much like a truck. Compared to the Pajero and Fortuner, the 1st Gen. Everest looked uninspired and quite dated. I somewhat get this feeling that around 10 years ago, Ford was just desperate to offer an SUV alternative cheaper than the Expedition or Explorer that they took the Ranger Pick-up and fused a campershell to make it resemble a wagon. The result was a “Sport Utility Vehicle” which was a lot more “Utility” and not really that “Sporty”. 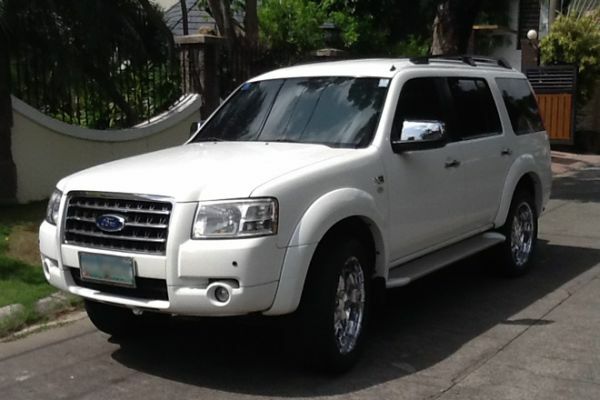 Then came the 2nd Gen. Ford Everest. This one is a much better designed vehicle. Smooth, rounded where it counts, and still massive like a Ford SUV should. It still has a truck feel, but this truck is a fashionable one. Being a “sedan” guy all my life, I found this vehicle initially hard to handle. Driving a car which is long, wide, and tall, I couldn’t see a good part of the road right in front of me; I can barely fit on the narrow side streets in Project 4, QC; and I am sure to scrape a pipe or the ceiling in many of the parking lots in the metro. And don’t even think of parking in Shangrila Edsa Plaza, Citibank Eastwood, or Rufino Tower — the side walls of the parking ramp will most likely be covered with your paint color before you get through. Honestly, for a while then, I was afraid that if I ever lose control of the vehicle, I would literally squash a few cars beneath me. But when i got the hang of it, it totally changed my view on SUV’s. I like the feeling of being tall enough to see above the other cars. I enjoy going through floods in high gear creating splashes 4 feet high. I like the sense of security that if I ever figured in an accident, I have a much better chance of surviving the crash. A big bonus is the psychological advantage whenever I drive the car in heavy traffic. Somehow, during tight squeezes along Nagtahan Ave. or EDSA, even passenger jeepneys swerve away. And surprisingly, no one has ever tried to cut in front of me ever. I don’t really know why, but I guess if someone sees a big serious looking vehicle taking no bull from any other car on the road, he’ d think it’s better to just let the car pass. Now, I would never wish or intend to cause any damage to anyone else on the road, but I guess if I really end up in a fender bender, this car would generally still be intact while the other car wouldn’t look too good. Inside, it feels as big as it looks. The seats are a bit low though making the legroom feel a bit cramped. But it’s big enough to carry 7 adults comfortably; maybe even 9 people total if you add 2 kids along. The mileage or fuel consumption is acceptable. The automatic transmission version I tested does 8km per liter on city driving and 10 kms. on the hi-way… and that’s on diesel fuel. The manual variant does 10km per liter on city driving and 12 kms. on the hi-way. Not bad for a big bad SUV that you can ride in style. A used Ford Everest 2nd Gen. 4×2 can be had today between P675,000 to P950,000 depending on the year, mileage, model, condition, and add ons. Yes bro. A very informative review and a very good idea that make me feel comfortable to take everest 2nd gen. My wife also like everest and were close our mind to get this suv. Thank you for your information. By the way i already made a test drive between the manual and the automatic. Both are good. Only final decision to make either automatic or manual. Again thanks for your own review. ?